Comics have been moving to a mass global market for some time in the format of the collected edition. Various formats are available and lately all for the same material: soft cover trade paperback, hardcover, oversized hardcover, omnibus, absolute edition, etc. Each brings something to the table, from a basic rebinding of the original 22 page issues to a complete rework of the material with a bonanza of bonus material. As with all things you get what you pay for, or so I thought. I’ m a big fan or archive editions, owning the first 100 Marvel Masterworks, all Graphitti Designs hardcovers and every volume 1 of DC Archives and all their Absolute Editions. I really like the oversized volumes and bonus materials that DC has produced and vainly hope Marvel will follow suit. Anyway, Dark Horse started their Archive line a few years ago but they were standard comic size and the material wasn’t anything I had been waiting for. Around Christmas I received a mailing from Steve Rude indicating they were offering 30% off all Nexus Archives: I love Steve’s art and am a sucker for his stuff. 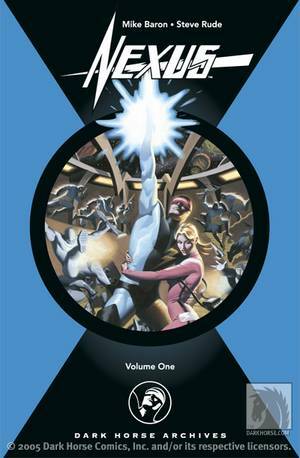 I already have the Graphitti Designs oversized Nexus hardcover but I went for volumes 1 to 3 of the Dark Horse Nexus Archives. When they arrived I ripped open the first volume and was floored: the material looked to be scans of the original comics. I checked the other two and they looked the same: slightly washed out bad 80’s colouring (that’s right, there’s a “U” in colouring). These books are $50 U.S. a pop and I’m getting a basic binding of books from the dollar bin. With a basic softcover trade I could possibly accept this, but this is an “archive edition” so I expected a little more. Checking Dark Horse’s product page they list the following: “Printed on high-quality paper stock and features a newly painted cover by Steve Rude”. Yes, that’s all we got. Credits list a collection designer, collection editor and art director: what did these people actually do?